Since 1994, St. Catherine of Siena Parish has served the Catholic faithful in the Kissimmee area and surrounding communities. We began as a Mission of Holy Redeemer Parish, and have quickly grown to be a parish of nearly 3,200 registered families. Our home, at 2750 East Osceola Parkway, consists of our multi-purpose worship building and temporary parish office structure. These facilities came into being in 1998 through the generosity of our parishioners and the Diocese of Orlando. We were established as a parish on August 12, 2000. In February of 2009, we were able to complete the expansion of these facilities. With this expansion, we have added nine rooms for the improvement of our ministry and have stepped forward to be able to build our much needed temple. We have dedicated four of these rooms for specific purposes; a new Chapel for the Blessed Sacrament, a new Music Room, a Food Pantry and a Religious Articles Gift Shop. The rest of the rooms are used for the different meetings and activities of the parish. On October 15, 2009, we finished the construction of temporary parking as part of the necessary phase in order to work on the final and permanent parking, and the new entrances and exits. On March 26, 2010, we completed the installation of the moveable walls with the purpose of having more space and capacity during the weekend masses. Gradually, with the efforts and contributions of all, we are moving forward with the goals of our parish. In the year 2013, we completed the site work: new entrances and the parking lot. This was the last step before we could build the desired and much needed temple building. In July 2017, with the blessing of Most Rev. John Noonan, our Bishop, we began the process of designing the New Church Temple. 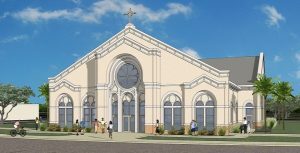 We have worked very hard, and the parish has been well represented by the Parish Construction Committee in making choices to give shape to the new Church. We presented the new design to the congregation at Sunday masses In September of last year, and groups meetings and it was received by all with great joy and enthusiasm. Later at a Town Hall meeting we presented the designs and the process of construction in more details. Today, our Temple is under construction. We thank God for guiding us to this point. Our new Temple will be fully built by March 2019, We thank all our brothers and sisters that in some form or another have contributed to this great project. And, I take this opportunity to invite everyone to be part of the dedication and consecration ceremony, dates and details will be published as they become available. We count ourselves privileged to minister to a community rich in diversity, united in faith, service and fellowship. Our parish continues to be a focus for important events in our lives. Here, we worship and honor God; here, we baptize new members into the community of Faith; here, people proclaim their life-long commitment to each other in love; Our parish also has ministers for the elderly, the sick, the poor, and all those in need of our help; here, we celebrate the gift of forgiveness; and here, we give thanks for the lives of our sisters and brothers who have completed their earthly journey into God’s loving embrace. This year, 2018, we saw the ordination of our two first priestly vocations: Fr. Blake Britton and Fr. Edwin Cardona; and also our second permanent deacon, Rev. Mr. Wilfrid Tilus. We are, also, celebrating the 5th Anniversary of the Perpetual Adoration in our Parish! And our Faith Formation program continues to be a beacon of hope in our community. By emphasizing stewardship, St. Catherine of Siena seeks to create a community that consistently invites people to deepen their relationship with Christ and each other, and to express this through commitments of time, talent, and treasure. A ) Stewardship of Time: Using my time on earth wisely; making time for personal prayer, family prayer, and quality time with friends and loved ones. B ) Stewardship of Talent: Using my God-given abilities to strengthen the Church and help others, especially through parish ministries, groups and activities. C ) Stewardship of Treasure: The wise and just management of my financial resources; giving back to God the first and best fruits of our labor by giving a proportionate amount of our income to the weekly parish offertory. St. Catherine invites parish members to tithe, that is to give 10% of our income to the parish ministry.